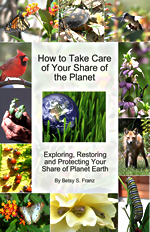 The book How to Take Care of Your Share of the Planet was published to encourage more people to learn what they can do from their own homes and yards to cut down on pollution, save natural resources and create landscapes that are friendly to wildlife. The book provides suggested activities and encourages readers to keep a journal as they get up close and personal with the wonders of their landscape. We strongly believe that this personal look at nature provides the tipping point necessary to turn environmental responsibility from an abstract issue into a personal one. We have repeatedly seen how fostering a sense of personal knowledge and protection for local species has resulted in an overall desire to protect the environment on a broader scale. Readers of the book are encouraged to share their findings with others through their journals and online blogs, thus allowing their new environmental enthusiasm to be spread exponentially. The book was specifically written for those with little previous knowledge about creating a healthy landscape. It is short enough and basic enough to encourage immediate participation, but comprehensive enough to make a huge impact. Special bulk prices available for retailers, builders, garden centers, environmental groups and others who want to help encourage others to Take Care of Their Share of the Planet. Suggested activities & journal entries: go outside!